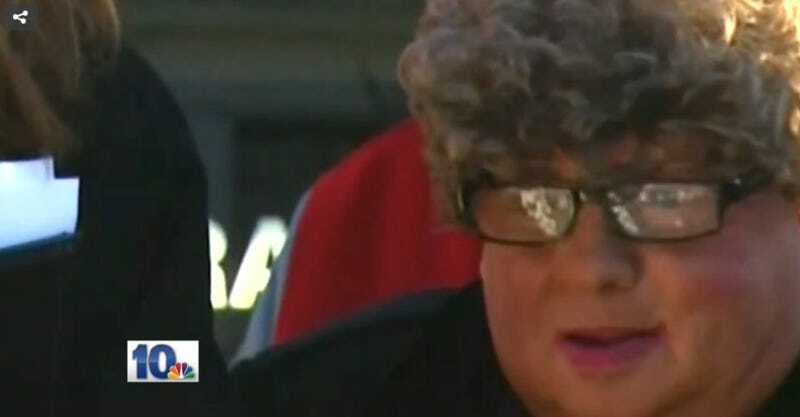 Today in news from Rhode Island we can’t quite understand: the head of a city agency has reportedly resigned for making an employee of hers, a male bus driver, dress up as an elderly woman for a press conference. There are photos. They don’t shed much light on what’s going on here, but they do exist. NBC 10 is reporting that Sue Stenhouse, the executive director of the city of Cranston’s Senior Enrichment Center, has resigned following allegations that she asked a bus driver to wear a blonde wig and makeup during a press conference. Here we are in the second paragraph and I’m still baffled, but somehow it feels too late to turn back. Fung’s office told NBC 10 that Stenhouse resigned and that they cannot comment on personnel matters. When NBC 10 visited Stenhouse’s Warwick home Wednesday evening, she at first told a reporter to go away. Then, she opened her door and exchanged a few words with NBC 10. For those who know Sue, she has never created a bizarre stunt to try to look good for the media. Everything she does is based on her willingness to reach out and help someone in the community. It is just like Sue to protect the seniors she served. I commend her for thinking of the safety of the frail seniors. It was 26 degrees last Tuesday and slippery by the snow pile (which was a prop as there was no snow)! Knowing Sue, I’m sure she was also thinking of the possibility of putting a “real” senior in harm’s way should someone recognize that person and go to their home to take advantage of them. I commend Sue and the staffer for putting safety first! Anyone who attends PR events knows they are staged. Political press events are often staged; ribbon cuttings; ordinance /law signing ceremonies; to name a few. In politics campaign ads are staged with the perfect demographic representation in the mix. How is this any different? Sad to see that politics takes precedence over a great victory for both the senior high students and the senior residents of the City of Cranston. Either this is deeply confusing and incredibly ill-advised, or it’s very creative problem-solving.